These round acrylic tables are a great way to make your products looks their best while also bringing a unique design dynamic to your space. The clear and sleek design will fit in seamlessly with any pre existing decor. 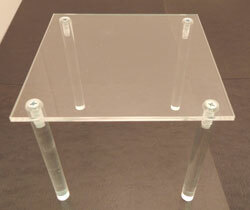 We carry multiple heights for this acrylic table to provide you with the most choices for your display needs. 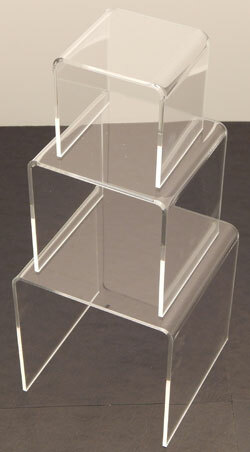 These display riser are constructed of 3/16" clear acrylic. Flame polished edges give this item a smooth finish. Available in cascading sizes or as a full set. 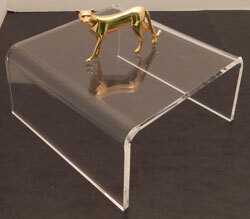 Maximize your display potential with these stylish acrylic display tables. 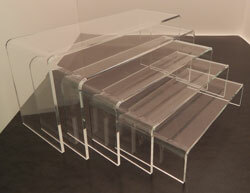 Tables feature clear acrylic top and matching legs, which are available in several sizes.